As I get older, the focus of my pc (personal collection) has evolved to include players or famous figures who are inspirational to me. I was born with impaired hearing. I am pretty much deaf in my left ear and have about 80% hearing in my right ear. For years I would cope by reading lips, forcing people to write things down and plain avoiding situations that I found intimidating. Unfortunately, I was never able to escape the ignorant few who made my life miserable for many years. I don’t look back to fondly at my youth, but there were a few shining lights that I will speak about. One of those shining lights was Jim Kyte. My Dad had told me that Jim Kyte was also hard of hearing and was playing in the NHL for the Jets. Back when I was a kid, we only got Leafs or Canadiens games on TV on Saturday nights. Mind you I wasn’t complaining about that as I am a Leafs fan. Every now and then I would be able to catch the Jets on TV. Jim was a beast! I was immediately enthralled. I remember vaguely writing to Jim for his autograph. I am saddened that I cannot seem to find it. 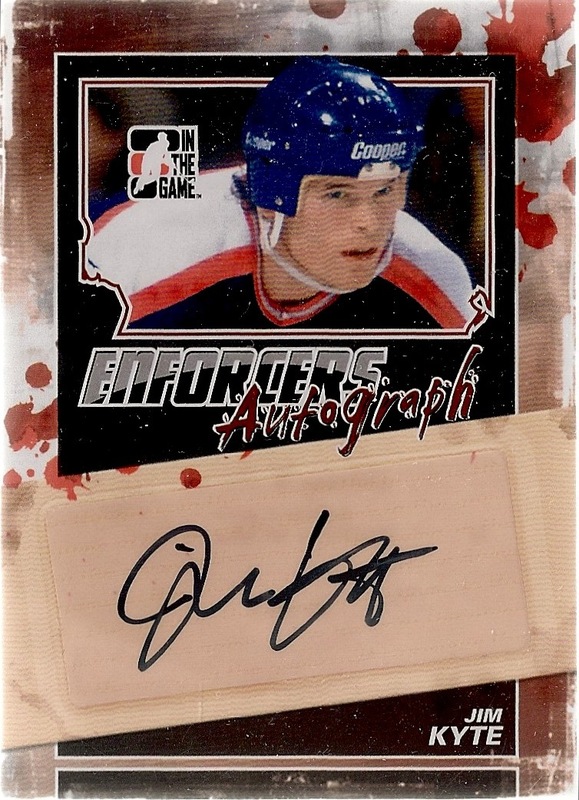 Fast forward many years later, In The Game releases Enforcers and I was able to finally land my Jim Kyte autograph that you will see at the end of this post. This made my day! Jim and his family founded the Canadian Hearing Impaired Hockey Association, a registered charity focused on the disability. I recently found out through wikipedia that he would work with children who had this disability at Stan Mikita’s hockey school in Chicago. Jim, Thanks for writing back to me as a child. I really needed role models who suffered from a hearing disability like I do. You wrote back to me and were very kind enough to grant me that autograph. I wish to this day that I had kept it, I would have surely put it in my book of memories. You are a true warrior and I thank you for your many years of service on the ice and off the ice. We need more people like you in this world. Just discovered your blog. Great post! Looking forward to reading more. Cheers!